View of the Falls on the Passaic River in New Jersey, North America. The falls are approximately 77 feet high and 280 feet wide and are some of the largest in Northern America. 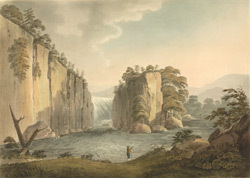 In 1778 Alexander Hamilton visited the falls and saw the potential for harnessing the power of the falls to run industrial machinery. In 1791 he founded the town of Paterson nearby and the falls became the nucleus for a burgeoning mill industry. The force of the water at the falls was used to run the first water powered cotton spinning mill.